I am a Guest Designer this month at Sweet Stamps Challenge Blog, so you will want to click to their site to reveal the whole card. Go ahead, click here and you can check out their cute website. Congrats on being their guest designer. Such a pretty card. Love the leaf border and the ribbon treatment. You are a busy little artist!! I am off to check out your card! congrats on the designer selection!!! Congrats on being the guest designer. Love the fall card. Gorgeous card, Penny! I spotted your work on the Sweet Stamps blog this morning and had to pop over and let you know I love this creation! I had to drop by your blog- from Sweet Stamps- thrilled to have you join us this month- and I love your border card technique- fabulous! 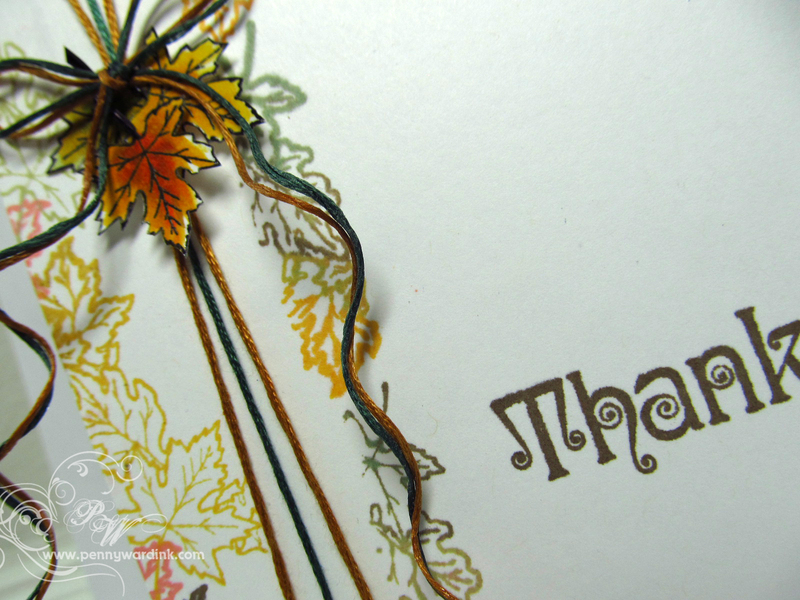 Such a beautiful fall card!! Love what you did with the leaves! !